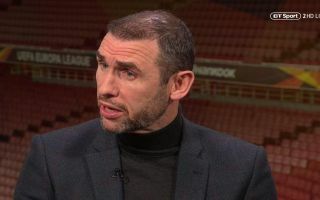 Former Arsenal defender Martin Keown shocked viewers tuning into the Gunners’ clash against Napoli this evening, when he told presenter Jake Humphrey that he could “put him away”. The former Arsenal defender certainly didn’t see the funny side to BT Sport presenter Jake Humphrey sarcastically making a joke after Keown pointed out that it “It’s very obviously only half-time in the tie…”, Humphrey got one over Keown after he interjected, saying: “Great observation, Martin”. It was surprising to see Keown react in the way he did, we don’t know as of yet if this is just what the banter is like between the pair or if Keown genuinely took offence to Humphrey’s comments. Martin Keown: "It's very obviously half-time in the tie." Many football fans wouldn’t have thought that Arsenal would win in such a comfortable manner tonight, if the Gunners perform like this against Napoli in the second-leg – it will be hard not to see them as favourites to lift the Europa League.